The classic arcade game Frogger snatched more than a few quarters back in the '80s. Hasbro's smash hit comes home with an entirely new look and sound. You'll hop through nine gaming worlds and dozens of levels based on themes from the original game. However, some special moves make getting through the worlds a little easier: your tongue can be used to collect power-ups, a super hop allows access to new areas, and the super croak will keep the enemies at bay. Should your friends want to join the action, there are several different multiplayer modes available. 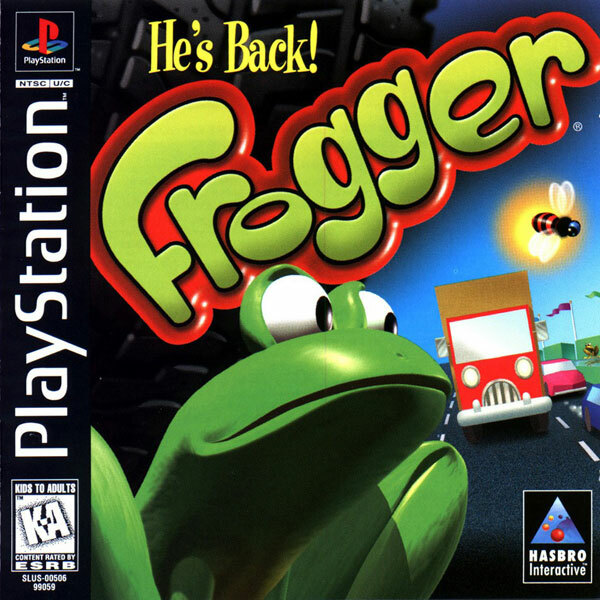 Anyone who liked the original Frogger will love the update. I received this game in great shape . What a fun and challenging game this one is. Great game for kids and adults alike. Came perfect condition. Complete as advertised, very happy. Great memories I'm 27 haha. Played this game so much as a kid and wanted to start playing it again. I got out my old ps1 and was looking for Frogger. I found the case but when I opened it up I found my Frogger game cracked in two. It was depressing to look at and I knew I had to get a new one. This site gave me a great offer, and when I got the game it ran very well. I used to love this game as a kid. No disappointment here! Plays very well. I love this game! My cousin, my sister, and I used to spend hours crowded around her computer playing this. Some of my favorite memories are due to this game. Game was in great shape. Looked brand new. Very fun and difficult game. Lukie never ceases to amaze me with the excellent quality of their games! The game was free (I used my reward points to get it) and it was in better than new condition, lukie's employees were also very helpful in helping me sort out a shipping issue. If I wasn't before I'm a loyal customer now 1,000%!! Frogger is my favorite game of all time. This version takes it to a new level and updates the game to compete with modern times. Love It!! I absolutely love this game. The shipping was fast and easy, I had no problems with the shipping of this product.